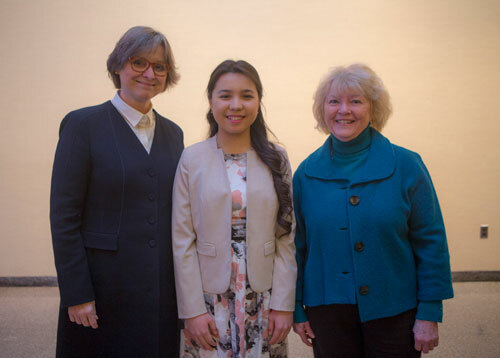 Towanda Area High School student Ezoza Ismailova competed this week in the state finals of the Poetry Out Loud contest, held at the State Museum in Harrisburg. HARRISBURG – Rep. Tina Pickett (R-Bradford/Sullivan/Susquehanna) congratulated Towanda Area High School senior Ezoza Ismailova, who competed this week in the state finals of the Poetry Out Loud contest, held at the State Museum in Harrisburg. Ismailova competed against 14 students from all over the state and vied for a chance to compete at the national competition in Washington, D.C., next month. Participating in the national final will be Madalina Richardson of Philadelphia. Rep. Tina Pickett (right) attended the state finals of the Poetry Out Loud contest at the State Museum on Monday to see Towanda Area High School senior Ezoza Ismailova compete. She was one of 15 regional finalists. The host for the event was Pennsylvania First Lady Frances Wolf (left). 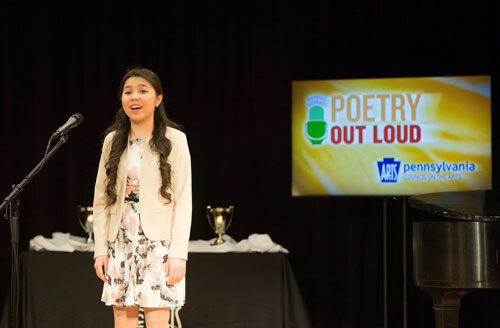 Created by the National Endowment for the Arts and The Poetry Foundation, Poetry Out Loud encourages high school students to learn about great poetry through memorization, performance and competition. The contest is facilitated through the Pennsylvania Council on the Arts, working with regional partners. Each student memorized and prepared three poems selected from print and online poetry anthologies. All 15 students performed in the first two rounds of competition, and five students took part in the third and final round for the championship. Students were judged on voice and articulation, physical presence, dramatic appropriateness, evidence of understanding, overall performance and accuracy. Throughout all levels, nearly 7,000 high school students participated in this year’s competition in 108 schools across the Commonwealth.